We’d love your help. Let us know what’s wrong with this preview of A Texas Christmas Homecoming by Nancy Robards Thompson. Elijah Lane left Whiskey River under a cloud of suspicion about a car theft he didn’t commit. After a stint in the army and years learning the wine industry, he’s back, ready to develop an elite boutique winery. With backing from a Hollywood A-lister, Eli intends to prove that this boy from the wrong side of town has made it big. There’s no one he wants to prove it to more Elijah Lane left Whiskey River under a cloud of suspicion about a car theft he didn’t commit. After a stint in the army and years learning the wine industry, he’s back, ready to develop an elite boutique winery. With backing from a Hollywood A-lister, Eli intends to prove that this boy from the wrong side of town has made it big. There’s no one he wants to prove it to more than Rachel Wilson, the high school sweetheart who didn’t believe in his innocence and married someone else practically the minute he left Whiskey River. Moved by the star-crossed couple's repressed passion, which is hotter than cinnamon candy and sweeter than sugar icing, a benevolent Christmas ghost, who lives for happy endings, might just be cooking up a delicious new chance for Rachel and Eli. To ask other readers questions about A Texas Christmas Homecoming, please sign up. There are four books in the series, each written by a different author but all featuring Felicity - the matchmaking ghost! She was looking forward to marrying the love of her life, Drew Harwood, after he returned from fighting in the First World War. However, fate intervened and she died of Spanish Flu shortly after his return. Felicity didn’t want him to stay alone and took steps to help him and others to find their HEA at Christmas. The second 'bad boy' from the less affluent area of Whiskey Ri There are four books in the series, each written by a different author but all featuring Felicity - the matchmaking ghost! She was looking forward to marrying the love of her life, Drew Harwood, after he returned from fighting in the First World War. However, fate intervened and she died of Spanish Flu shortly after his return. Felicity didn’t want him to stay alone and took steps to help him and others to find their HEA at Christmas. The second 'bad boy' from the less affluent area of Whiskey River to feature in this series is Elijah (Eli) Lane who left the area after being suspected of stealing the car belonging to the mother of his secret girlfriend, Rachel Wilson. He wasn't the thief but Rachel didn't back him up and, disillusioned, he left to participate in a scheme which helped him turn his life around. He's been in the army and to college as well as working in the wine industry and now he's returned to help set up a new vineyard in partnership with his two teen friends who have also done well after leaving the Barrels. He's determined to show Rachel that he's made something of his life . . . . even though she married someone else shortly after he left. Rachel was devastated when Eli left without contacting her. She believes he abandoned her without a second thought but there are secrets to be revealed and a matchmaking ghost with lavender scent who will strive to help these two to uncover what happened and to move on to their own HEA together. However, even though their attraction is a hot as ever, there are other considerations this time around, including Rachel's determination to make a success of her backing company and her delightful young daughter! The angst and drama run riot through this third story in this festive season. Some of the events from the second book also feature in this one and it is great to read about them from a different point of view. This is a story to have your taste buds tingling as Felicity, the Harwood's matchmaking ghost, tries to work her magic for another couple this Christmas. It is a delightful read and I thoroughly enjoyed it. Now I can't wait to read the fourth and final story in this series! A Texas Christmas Homecoming, book three in the Whiskey River Christmas series. A sweet second chance at love story. Like the books before it it brings to the storyline Felicity, a matchmaking ghost. The main characters in this book are Rachel, her daughter Katie and Eli. Plus visits from past characters in the series. I enjoyed reading about these characters again and the dialogue between them. I'm looking forward to reading more books by I voluntarily read a advanced reader's copy of this book. This is a wonderful Christmas romance. I love this series. Elijah and Rachel have a chance at reuniting when their paths cross after going separate ways after high school. I recommend reading the entire Whiskey Rivers series. Felicity, our matchmaking ghost, has a real challenge in front of her this time in the once in love young couple Rachel and Eli. Separated when Eli was scent to California to attend required vocational schooling – for something he didn’t do – Rachel went on with her life. She didn’t want to believe the things her mother said Eli had done were true, but he never contacted her before he left so she let a young love die. Her marriage a short time later wasn’t what she thought it would be, yet at least she got her adorable daughter from that union. Now Rachel’s life revolves around Katie and the cookie shop she’s opened in Whiskey River. Her life is full and with adding catering and another dream on the back burners, well, Rachel is full to bursting with things and people needing her attention. She never, ever thought she’d run into Eli again. And she certainly never expected to suspect that a ghost was playing a part in their romantic reunion. Eli left Whiskey River as a young man with an unsettled future. He’s returned as an adult passionate about his calling in the creation of amazing wines, ready to go into business with two of his life long friends. He also has returned for answers from Rachel. He’s never really stopped loving her, and her betrayal never set right with him, there had to be more and he was determined to find answers. What he did find was a love that had never grown cold and a woman who is afraid to trust herself or let others in to her life. He intended to change that… eventually. I enjoyed Rachel and Eli’s romance very much. Parents think they’re doing the right thing for children, and maybe at times they do. But once the children are adults, their future is up to them. What you see in front of you isn’t always the entire story, and Eli’s situation proves that very well. Felicity is her usual fun, loving and mischievous self. I adore her matchmaking ways. If you’re looking for a Christmas romance to celebrate love, family and good memories then I”d recommend the Whiskey River Christmas series as every story is slightly connected, and each story gives you a delightful couple and the timeless magic of love. this is Rachel Wilson and Elijah Lane's story. Not only did she need to make it work, but she also needed to make people take notice of her food. To prepare, she’d placed an ad in the Whiskey River Review and had hired a temporary team of cater waiters to work the party. The last thing Elijah Lane wanted to do his first weekend back in Whiskey River was go to a stuffy charity gig. That crowd hadn’t embraced him when he’d lived here before. What were the chances that they’d welcome him now? A Texas Christmas Homecoming by Nancy Robards Thompson is a wonderful well written 5 star book. This book will make you believe in the magic of Christmas. Every Christmas since her death in 1918, Felicity Blanchard returns to Harwood House to help unite deserving couples. This time Felicity sets her goals on Rachel Wood and Elijah “Eli” Lane. Rachel and Eli broke up years ago after Eli was caught driving Rachel’s mother’s car and it was assumed he stole it. Rachel’s mother made Eli leave town without him ever saying goodbye to Rachel. Rachel thought he just gave up on her. So, Rachel moved This book will make you believe in the magic of Christmas. Rachel and Eli broke up years ago after Eli was caught driving Rachel’s mother’s car and it was assumed he stole it. Rachel’s mother made Eli leave town without him ever saying goodbye to Rachel. Rachel thought he just gave up on her. So, Rachel moved on with her life and ended up in a bad marriage. The only good thing she had from the marriage was her daughter and she was determined to raise Katie the best she could and give her all the love and attention she deserved, unlike the way Rachel was brought up. Rachel lives a modest life, but she has her own cookie shop which was one of her dreams. While catering the annual Christmas Ball at Harwood House, Rachel runs into Eli. He is back in Whisky River and is planning to open a winery with his friend Logan. When Eli was sent away by Rachel’s mother, he went to work on at a vineyard in California where he discovered his new passion. He ended up getting a degree in viticulture and enology. Eli brings his expertise with him to start the new vineyard. But he has unfinished business with Rachel. He needs to talk to her about how things ended between them. Will Felicity’s magic work on Rachel and Eli like it has for couples of the past? I really enjoyed this heartwarming story. Felicity’s ghost made for some unique scenes. Eli and Rachel definitely deserved a second chance after how things ended between them and I was happy to see them work it out. Every time I smell lavender, I will be reminded of Felicity and this memorable book. I enjoyed ready this amazing second chance story at love, A Texas Christmas Homecoming by Nancy Robards Thompson, book three in the Whisky River Christmas series. Elijah Lane left Whiskey River under a cloud of suspicion about a car theft he didn’t commit. After a stint in the army and years learning the wine industry, he’s back and ready to develop an elite boutique winery. He wants to prove that the boy from the wrong side of town has made it big to those who didn’t believe in him but more so I enjoyed ready this amazing second chance story at love, A Texas Christmas Homecoming by Nancy Robards Thompson, book three in the Whisky River Christmas series. Elijah Lane left Whiskey River under a cloud of suspicion about a car theft he didn’t commit. After a stint in the army and years learning the wine industry, he’s back and ready to develop an elite boutique winery. He wants to prove that the boy from the wrong side of town has made it big to those who didn’t believe in him but more so to Rachel Wilson, his high school sweetheart who didn’t believe in his innocence but also married someone else practically the minute he left Whiskey River. Now widowed, Rachel is busy raising her daughter and running her cookie shop. She has no time or interest in romance. She might regret not standing behind the boy her mother convinced her was certain to become a ne’er-do-well like the father who abandoned them. This star-crossed couple share an out of this world attraction which moves a compassionate Christmas ghost, who lives for happy endings, and who might just cook up a delicious second chance for Rachel and Eli. I really enjoyed this sweet love story and had trouble putting this book down, reading this book in one day. Nancy is a wonderful story teller, drawing me into her books, making me forget the world around me as she drew me in and not let me go until I turned the last page. I highly recommend this book to other readers. Eli left Whiskey River and never wanted or expected to come back, especially since his girlfriend didn't stand up for him. Now, he's back to start his winery and ready to show Whiskey River how much he has changed, starting with Rachel. Rachel came back to Whiskey River several years ago, widowed and pregnant. She found her place in town, running her own cookie bakery. She is contemplating her next step when Eli returns to town. Rachel is sure of one thing, she can't give him a chance to break h Eli left Whiskey River and never wanted or expected to come back, especially since his girlfriend didn't stand up for him. Now, he's back to start his winery and ready to show Whiskey River how much he has changed, starting with Rachel. Rachel came back to Whiskey River several years ago, widowed and pregnant. She found her place in town, running her own cookie bakery. She is contemplating her next step when Eli returns to town. Rachel is sure of one thing, she can't give him a chance to break her heart, again. When Felicity's ghost steps in to give them a push, Eli and Rachel have to decide if they deserve a second chance to be together. Nancy Robards Thompson works her magic to weave a sweet tale of a couple that gets a second chance with the help of a sweetly meddlesome ghost who has made it her mission to unite couples that she believes should be together. The characters are well-developed and the story keeps you hooked from page 1. No one knows the unfairness of life more than Felicity. So if she is unable to right a wrong, she will at least try to reunited former teenage sweethearts in A Texas Christmas Homecoming by Nancy Robards Thompson. What an enjoyable series this has been with the historical and then contemporary romances that Felicity has tampered, maybe helped, with along the way. This time it is two from different sides of the railroad track who were separated by accusations and suspicions from the past. Elijah L No one knows the unfairness of life more than Felicity. So if she is unable to right a wrong, she will at least try to reunited former teenage sweethearts in A Texas Christmas Homecoming by Nancy Robards Thompson. What an enjoyable series this has been with the historical and then contemporary romances that Felicity has tampered, maybe helped, with along the way. This time it is two from different sides of the railroad track who were separated by accusations and suspicions from the past. Elijah Lane and Rachel Wilson have moved on from high school, but feelings are rekindled in this second chance romance. First, regrets, forgiveness and the need to prove oneself must be faced before love can bloom in this Whiskey River Christmas #3 book. This Christmas romance will make the reader into a believer in the magic and power of love. Elijah is coming home and he is not coming home a "barrel boy" but someone people are taking notice. He just wants one person to notice and he wants answers. Rachel is busy running her company and it seems like everyone wants something and she is becoming something she doesn't want to be. But when Elijah walks back into her life she has a lot of questions but not a lot of answers. Can they get to the bottom of the questions or is it better for them both to walk away? Who doesn't love a good cowbo Elijah is coming home and he is not coming home a "barrel boy" but someone people are taking notice. He just wants one person to notice and he wants answers. Rachel is busy running her company and it seems like everyone wants something and she is becoming something she doesn't want to be. But when Elijah walks back into her life she has a lot of questions but not a lot of answers. Can they get to the bottom of the questions or is it better for them both to walk away? Once again being transported to Whiskey River, Texas for a delightful Christmas story is the perfect way to kick off the holiday season. With romance, a ghost in the name of Felicity who has a penchant for bring couples together when they've set up road blocks in doing so themselves (leaving the essence of lavender in her wake), and a celebration as only the town of Whiskey River puts one to kick off the holidays, there is no shortage of ways this story contains the perfect mixture of love, fami Once again being transported to Whiskey River, Texas for a delightful Christmas story is the perfect way to kick off the holiday season. With romance, a ghost in the name of Felicity who has a penchant for bring couples together when they've set up road blocks in doing so themselves (leaving the essence of lavender in her wake), and a celebration as only the town of Whiskey River puts one to kick off the holidays, there is no shortage of ways this story contains the perfect mixture of love, family, and friends to leave you with a heartwarming feeling. With the different authors in the series interweaving characters from each others books in the series, the the charm and spirit of the storyline invokes the joys of the holidays, leaving a feeling of warmth and comfort by the time the story ends. Another lovely story from Nancy Robards Thompson, A Texas Christmas Homecoming is the third story in the multi-author Whiskey River Christmas series. Each is stand-alone or they can be read as a series. This is a second chance at love story for both single mother Rachel and Eli, the man she loved as a teenager ten years earlier, a relationship that failed thanks to interference from her mother. Throw in a matchmaking ghost and you have the makings of a whimsical romance. 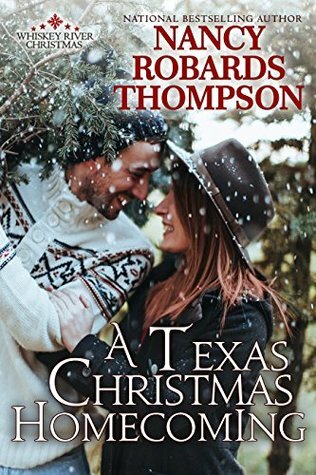 I really related to Rachel Another lovely story from Nancy Robards Thompson, A Texas Christmas Homecoming is the third story in the multi-author Whiskey River Christmas series. Each is stand-alone or they can be read as a series. I really related to Rachel, who loves her work, is dedicated and hardworking but fights with the guilt she feels at spending so,little quality time with her three year-old daughter Katie. Eli is gorgeous, both physically and emotionally. He’s the quintessential boy from the wrong side of the tracks made good. This book is a must for holiday reading. Although this Whiskey River Christmas book is the third out of 4, (I plan to read the others) It was also a great stand alone story that will make you want to go back to Whiskey river to enjoy the other stories. The Whiskey River authors are Katherine Garbera, Eve Gaddy, Nancy Robards Thompson and Julia Justiss. In this story, Eli and Rachel are sweethearts who get a second chance on true love. I think that if they hadn't been torn apart Rachel wouldn't b This book is a must for holiday reading. Although this Whiskey River Christmas book is the third out of 4, (I plan to read the others) It was also a great stand alone story that will make you want to go back to Whiskey river to enjoy the other stories. The Whiskey River authors are Katherine Garbera, Eve Gaddy, Nancy Robards Thompson and Julia Justiss. In this story, Eli and Rachel are sweethearts who get a second chance on true love. I think that if they hadn't been torn apart Rachel wouldn't be a widow with a beautiful 3 year old and Eli wouldn't be developing a winery in Whiskey River. There is a Christmas spirit in this story who with what I like to call Lavender magic helps when Rachel doubts not only herself but Eli as well. One of the big eye openers for me was the preacher's wife doing the steamy Santa baby dance. . .Well, you will just have to read this story for yourself. It's a officially included in my holiday books from now on! Can a spirit truly play matchmaker? Eli and Rachel's book part of the Whiskey River Christmas series. Each h book can be read separate but if you read them all you really get a Fun Texas series. There is a ghost who loves to play matchmaker....you know she is around by the lavender smell in the area that only those involved can smell. In this book about Second Chance Love Eli comes back to Whiskey River to work with Logan on a winery. The winery will employ at risk youth of the town...just like t Can a spirit truly play matchmaker? Another wonderful Whiskey River story! Rachel and Eli were an item in high school, against her mother's wishes. Now several years later, Rachel is a widow and a mother, and Eli is back in town as well. The attraction is still there, and a certain romantic ghost from the past is trying to push these two together. I loved the characters in this story. Rachel is such a wonderful mom, but a little paranoid about spending too much time working. So normal worries most mothers have. Eli is so understandi Another wonderful Whiskey River story! Another fantastic read in this holiday series. Love and second chances continue when Elijah Lane and Rachel Wilson are reunited this holiday season. They were high school sweethearts with plans for the future. That future never happened when Eli left town abruptly with rumors flying about his participation in a car theft. Rachel never believed it but as the years have passed she's moved on. When Eli comes back to town to start up a new vineyard it is apparent their attraction to each other is st Another fantastic read in this holiday series. Love and second chances continue when Elijah Lane and Rachel Wilson are reunited this holiday season. They were high school sweethearts with plans for the future. That future never happened when Eli left town abruptly with rumors flying about his participation in a car theft. Rachel never believed it but as the years have passed she's moved on. When Eli comes back to town to start up a new vineyard it is apparent their attraction to each other is still there but will hearts be broken a second time if they take a chance? Or will that future they talked about all those years ago finally come true? This is Elijah and Rachel’s story. Another great addition to the Whiskey River Christmas series. Due to misunderstandings and deceptions Eli and Rachel lost touch with each other. Years later their paths cross again. The chemistry between is still intense if not more. Will they be able to trust each other again? This was a heartwarming and sweet Christmas romance. I really enjoyed Eli and Rachel’s characters. I love a second chance romance and this one in Whiskey River between Eli and Rachel was good for my heart, there was some laugh out loud lines and laughing is good for you. Also I found someone in Rachel who doesn’t like going to fancy parties where you have to dress to the nines just like myself, but she had a funnier way of expressing it. Loved how Felicity’s spirit showed up in this one, the author did this up right, even that touch of goosebumps moment. It was a great Christmas story. Eli & Rachel had been in love back in high school but a misunderstanding had sent him away. In the time he was gone he learned all about the wine business. Going back to his roots where him & his best friend was going to plant a start a winery/vineyard. He reconnects with his lost love that is now a mother to a 3 year old daughter. A happy ending has a start of a new family. A story about second chances at love, with both main characters carrying emotional baggage and pain, but also craving for redemption (especially the hero). A good Christmas read or a good way to spend an afternoon. The baking dimension is delicious and mouth watering and I’ve enjoyed all the romantic implications of Eli and Rachel’s story. The complexity of Rachel and Elijah's past in Whiskey River really made me wonder if even the matchmaking powers of the ghost of Felicity would be able to bring them together. The path to reach that destination was a captivating, fall-in-love Christmas delight! "legend has it that if you smell the scent of lavender at Harwood House, you're about to meet your soul mare.."
This was a sweet and heartwarming second chance romance story. Eli and Rachel were both cute and funny together and there were some funny lines in this book. I would tecommend for anybody looking for second chance love, especially in the winter with Christmas time!! A Whiskey River ghost decides to use her matchmaking skills on Eli and Rachel in this second chance romance. Throw in cookies, wine and a precocious little girl and you have a wonderful holiday story. A sweet second chance romance at Christmas. Eli was trying to find his bearings coming home, and Rachel was at a fork in the road with her baking. A great way to spend some time reading! I have not read the others in this series but wish I had. Very enjoyable. Loved the story line and the characters. Great Christmas read. Here is a Christmas story as pleasant and soothing as the wafting fragrance of lilac and as colorful and interesting as the Texas town of Whiskey River. The story of Felicity and love at Christmas continues in a wonderful way with this book in the series. Our couple who needs to be nudged this time consists of Rachel, an aspiring chef and businesswoman and Eli, an aspiring vintner. They met in high school, parted in an unfortunate way, survived some major challenges and now are back together in W Here is a Christmas story as pleasant and soothing as the wafting fragrance of lilac and as colorful and interesting as the Texas town of Whiskey River. The story of Felicity and love at Christmas continues in a wonderful way with this book in the series. Our couple who needs to be nudged this time consists of Rachel, an aspiring chef and businesswoman and Eli, an aspiring vintner. They met in high school, parted in an unfortunate way, survived some major challenges and now are back together in Whiskey River. While their attraction is strong, and the romantic scenes to prove it in this book are well-written, and evocative, Rachel and Eli continue to get in their own ways until Felicity guides them to a happy Christmas. I won’t try to pursue this…us…if there is no us in your heart. I love you. There will always be an us for me. Readers will enjoy as I did, the holiday scenes at Harwood House and the activities in the Whiskey River town square. Rachel is a spunky young woman with supportive friends and a Mom and a daughter that add spice to her life and Eli is all that leading man should be.